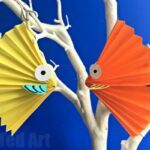 Our love affair with EASY Origami for kids continues. 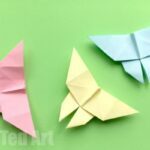 Many people are “frightened” of Origami and think it is “too hard” or that if you don’t get the Origami Folds “just so”, the origami pattern will not work. Not true! 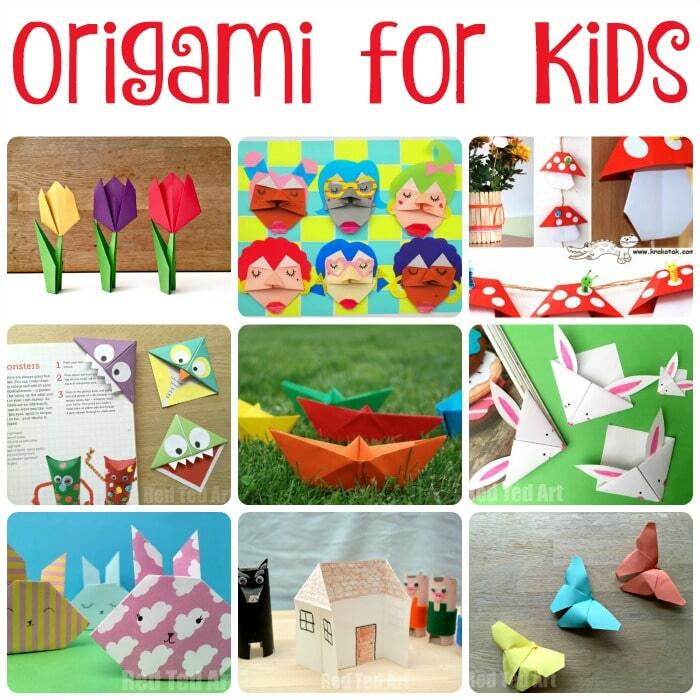 Of course SOME origami is like that and of course the neater your make the folds the better, but there are also many many origami projects for kids, that are super child friendly and the perfect origami for beginners. 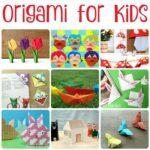 They help you develop fine motor skills, cognitive skills in following patterns as well as help you develop your origami folding confidence. 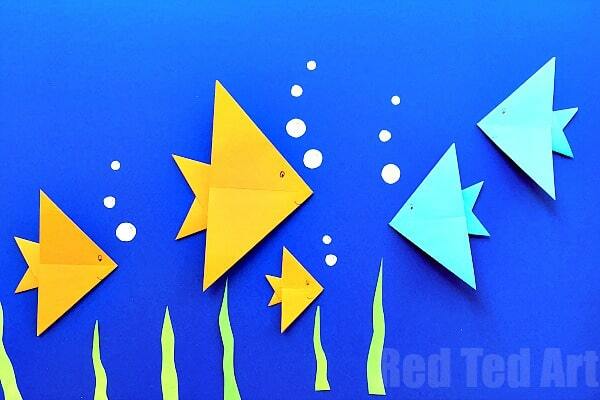 Today we would like to share a super duper EASY FISH ORIGAMI. This cute little fish is indeed very easy. It is a great beginners project, learning to next “type” of Origami fold. It looks lovely on the front of Greeting Cards (maybe make them as part of a summer camp project), as part of a under the sea collage (maybe add some of our Origami whales to it? 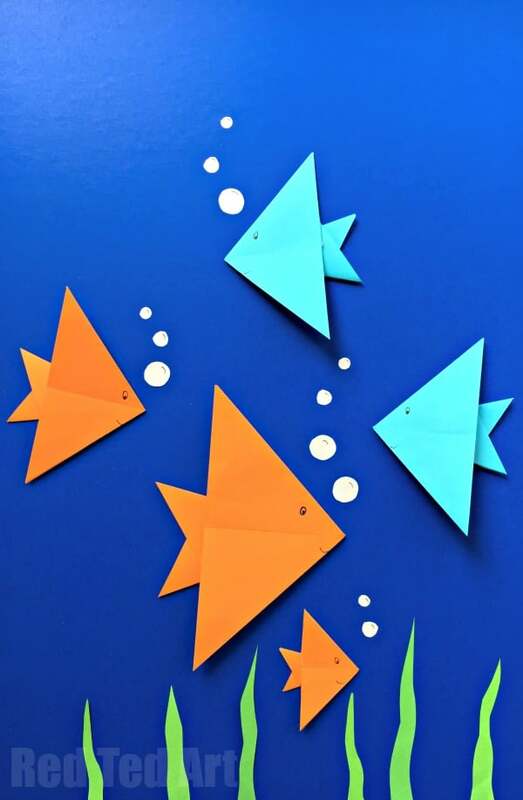 ), and could also look lovely as a simple Origami Fish mobile. 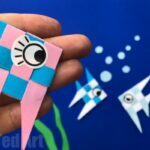 We used a sheet of A5 paper and cut it down to square – using the left over “strip” for making the little baby origami fish. Of course you can just use standard square origami paper! As mentioned before, this is a great Easy Fish Origami. 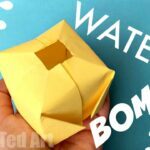 And as with MANY of our Origami Projects, we have a fabulous short YouTube video to help explain the steps. 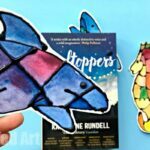 It really is great for visual learning (and oh, you may like out wee little Fish Animation at the beginning too!! Teehee, so cute). As mentioned, it introduce a great classic fold for Origami Beginners and a great way to learn and practice your origami skills! 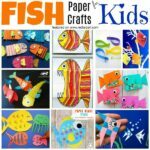 Hope you have a go at making these wonderful Easy Origami Fish!! 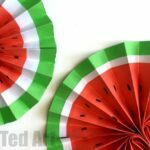 DIY Paper Fan – Melon Fans!